Are your Sunbeam Stand Mixer Beaters missing, bent, rusty or broken? You may need a new pair of Sunbeam Mixmaster beaters 103350. 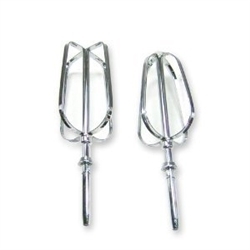 These stainless steel beaters are made to fit Mixmaster Series models listed below. Note that these beaters are a matched set. This set replaces Sunbeam original part numbers 013758-000-000 and 013759-000-000. 5600 5600-20A 1-40BH 01401 1-40CE 1-41BM 01416 1-42BP 01421 1-43BQ 01430 1-44BN 01440 1-42BP 01451 01460 1-46CB 1-90CC 01901 1-92BX 01921 1-93BX 01930 1-914BZ 01940 2355 2355-1 2356 2356-1 2358 2358-1 2359 2359-040 2359-1 2360 2360-1 2360-2 2381 2381-0.